Too often marketing is only done when there is capacity to fill. If this is your strategy, you will be disappointed with the results. For best results, marketing needs to be consistent. You need to create an activity plan outlining the activities you are going to do, who is going to do them and when they need to get done by. A simple spreadsheet is all you need to plan and track your activities. You don’t need an exhaustive list on your marketing mix. One direct mail piece a quarter and a monthly e-newsletter might be sufficient to keep your firm top of mind with your clients and prospects. Just make sure it happens every quarter or every month. Your phone won’t immediately start ringing, and don’t be disheartened by this, but the more regular and consistent you market to your prospect list, the more your phone will ring. When developing your marketing materials make sure you do more than just promote. This is your opportunity to demonstrate the value you could potentially bring. 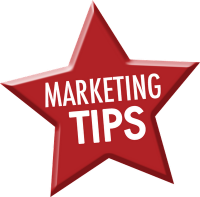 A final tip developing your marketing pieces, use twice as many ‘you’ and ‘yours’ than ‘I’, ‘we’, and ‘ours’. Look for technology and implement systems that that will make this easier. An email newsletter is the perfect starting point. Once it’s created, it should look after itself.